Stars; Zachary Levi, Mark Strong, Asher Angel, Jack Dylan Grazer, Djimon Hounsou, Grace Fulton, Adam Brody, John Glover, Cooper Andrews, Lovina Yavari, Marta Milans, Faithe Herman, Ian Chen. 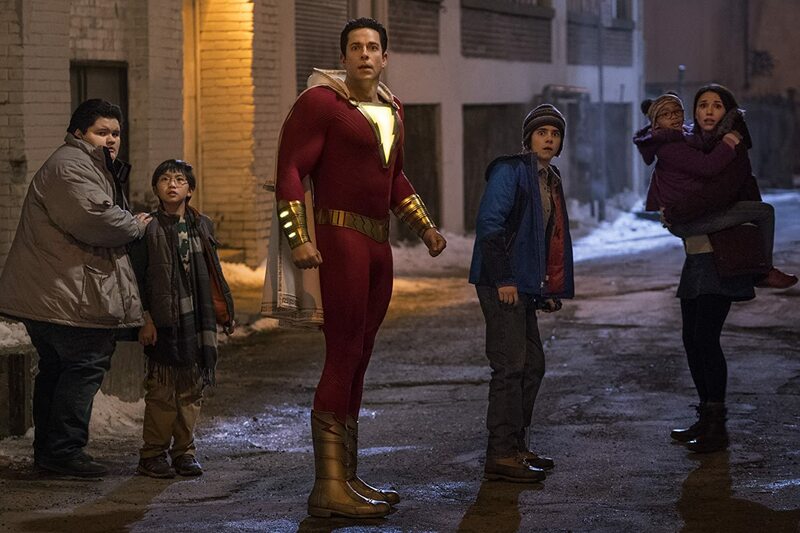 If, like me, you are suffering from a dose of superhero movie fatigue then Shazam! may just be the antidote you’re looking for. Created in 1939 by Bill Parker and C C Beck, Shazam! is a silly but entertaining movie that takes the mickey out of the usual tropes of the genre while giving us an origins story for the character. Fourteen-year-old streetwise Billy Batson (Asher Angel, from tv series Andi Mack, etc) has been bounced around a succession of foster homes since he was abandoned at an amusement park by his mother. He has been constantly searching for her but with little luck. When the film opens, he is living in a multi-racial group home that he shares with orphaned misfits like the disabled Freddy Freeman (Jack Dylan Grazer, from It, etc), a comic book nerd and superhero obsessed fanboy. Through a series of unlikely events Billy is transported into a parallel realm where, in a cavernous lair known as the Rock of Eternity, he meets the mystical centuries old wizard Shazam (Djimon Hounsou) who is seeking a champion “pure of heart” to defend the earth from the forces of evil. Whenever he utters the word “Shazam!” Billy is transformed into a muscle-bound spandex costumed superhero who is bulletproof, super-fast, strong and can even fly. With the help of the enthusiastic Freddy and his video camera Billy tries to harness his superpowers, which leads to a clever and funny montage full of physical humour. But Billy struggles to comprehend that with great power comes great responsibility. But every superhero needs a supervillain to fight, and here his nemesis is Dr Thaddeus Sivana (played by Mark Strong, from Kingsman, etc) a cruel and petty inventor who is working through his own set of parental issues. As a child some thirty years earlier, Thaddeus had come across Shazam, but because he was tempted by the presence of the seven deadly sins, ancient demons that have been imprisoned in stone and guarded by Shazam, he was rejected. Thaddeus has harboured an obsession over Shazam and the strange powers he could convey ever since. Now he has managed to track down the mysterious lair and acquired powers through an energy ball that attached itself to his right eye. This gives him the power to awaken the seven deadly sins into physical carnations, which he uses to wreak havoc on the world. When he sees Freddie’s viral videos of Shazam and his powers he sets out to destroy him. This sets in motion a chain of events that leads to a CGI heavy superhero smackdown between Shazam and Sivana at an amusement park and in the skies over Philadelphia. The fact that the main characters are still teenagers at high school allows the writers Henry Gayden (Earth To Echo, etc) and Darren Lemke (Goosebumps, etc) to work in themes of bullying, the importance of family and friends and home as well as the usual good versus evil structures. Shazam! has been directed by David F Sandberg, who gave us the superior horror thriller Lights Out in 2016. Here he deftly juggles the action sequences with generous doses of humour and litters the film with plenty of in-jokes to reference the whole DC universe. And the CGI effects are also very good. Sandberg gives Shazam! the look and feel of those wonderful 80s films from Spielberg’s Amblin studios. It has been nicely shot by Belgian cinematographer Maxime Alexandre (The Nun, etc). A buffed-up Zachary Levi (from the tv series Chuck, etc) is wonderful as the eponymous hero. And he brings a mix of goofy charm, childlike naivety and innocence to the role and he offers a knowing wink to the audience. Apparently, creator Beck based the design of character on actor Fred MacMurray, who was the top box office draw at that time. Both Angel and Grazer are very good in their roles, while Grazer’s performance as Freddy lends an emotional gravitas to the material. Grazer and Levi also share a great chemistry. And Strong always has a strong, intimidating screen presence which is put to good use here. And he seems to be enjoying himself immensely as the evil Sivana. As you may have gathered, Shazam! is decidedly lighter in tone than the dark, gloomy and dour tone of most of the other offerings from the DC stable of superheroes. Shazam! is the seventh film in the DCEU, and it delivers the spectacle, but it also shows that the DC extended universe is moving towards a more breezy, lighter, more colourful and family friendly take with its stable of superheroes that began with last year’s blockbuster Aquaman, and holds out promise for future entries in the series. Filed Under: Film Review Tagged With: shazam!